Neil Warnock has been the Championship manager of the season so far, according to Derby County boss Gary Rowett. 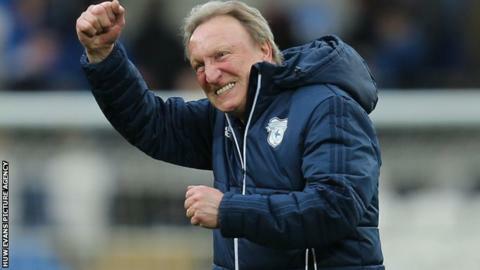 Warnock's Cardiff City side are second, just three points off the top, prior to the game against Rowett's fifth-placed Rams at Pride Park on Sunday. "Neil has done a fantastic job," Rowett told BBC Radio Derby. "I spoke to him in the summer. He said the Championship is the most open it has been and there's a real opportunity. He called it." The Bluebirds have won seven league games in a row and are unbeaten in nine. A haul of 25 points from 27 has seen them move to within one victory of leaders Wolves and seven points clear of Aston Villa in third. Rowett said: "Neil knew there was chance for his type of side to get up there. And the way they play, nerves don't really come into it as as much as other teams who are perhaps trying to play through the thirds and play a more passing style of football." Derby are 14 points behind Sunday's visitors having failed to win any of their past seven games. Warnock says the money spent by their rivals means the pressure is not on his side, but Rowett disagreed. "Every manager is trying to deflect the pressure off their team, which is what every good manager does," he added. "But as much as you say you are going to enjoy it, the reality is that they have something to lose now and we will see how they handle it. "They have a done fantastic job so far and you have to give them credit."